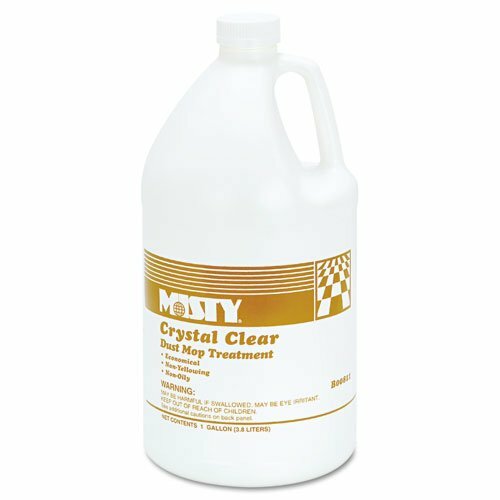 Misty - Dust Mop Treatment, Attracts Dirt, Non-Oily, Grapefruit Scent, 1gal, 4/Carton R811-4 (DMi CT by MISTY at Blog Free Here. MPN: R811-4 (DMi CT. Hurry! Limited time offer. Offer valid only while supplies last. Crystal clear dust mop treatment is a dressing for dust mop heads to aid in the removal of dust, dirt, and other abrasive matter from floor surfaces. Crystal clear dust mop treatment is a dressing for dust mop heads to aid in the removal of dust, dirt, and other abrasive matter from floor surfaces. Mop heads treated with this compound act as a "dust magnet" to attract and hold particles until mop is cleaned or laundered. Treatment is non-oily and leaves a dry, protective, plasticized film on the surface of wood, asphalt, linoleum, vinyl, vinyl composition, rubber, terrazzo, concrete and gymnasium floors. Will not harm waxed or finished surfaces, and floors appear brighter and more lustrous. Application: Dusting Solution; Applicable Material: Asphalt; Finished/Sealed Wood; Vinyl Composition Tile (VCT); Solid Vinyl Tile (SVT); Linoleum; Sheet Vinyl; Laminates; Rubber; Quarry Tile; Sealed/Engineered Stone; Sealed Cement/Concrete; Ceramic Tile; Terrazzo; Dirt Types: Debris; Dust; Soil; Scent: Grapefruit.